This fertile family consists of amphidiploid arilbred dwarfs with two sets of 8 chromosomes from I. pumila and two sets of 10-11 aril chromosomes. A few members of this family were produced in the mid-20th century by crossing I. pumila with the tetraploid Regelia species Ii. hoogiana and stolonifera. More recently, Harald Mathes produced 'Barbarella' and Francesca Thoolen gave us 'Aladdin's Gem', both from tetraploid regeliocycli or oncogelias derived from colchicine-induced tetraploids. Oddly, both are pollen fertile only. Although it is reported that Peter Werckmeister and others have raised large numbers of fertile seedlings in this family, none of them are presently available in commerce. Hence this fertile family must be enlarged by creating new pumila x tetraploid aril hybrids and interbreeding them. Ideally, these crosses should be made using the widest possible range of both parental types. This is a major focus of my hybridizing plans, and my primary reason for acquiring a solid collection of I. pumila and of the tetraploid arils. 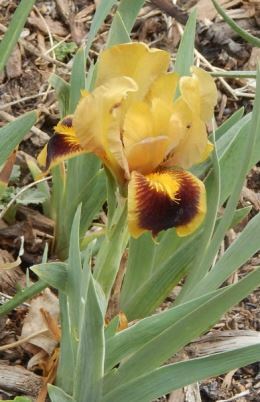 It would be a shame if this intriguing family of irises, with so much unrealized potential, were to dwindle away because so few varieties are obtainable. 1. APP triploids: These are produced by crossing diploid arils with I. pumila. Three were produced and introduced by Jonnye Rich. With this approach, it is possible to introduce diverse oncocyclus genes into the arilpums directly, instead of going through the strongly regelia-influenced tetraploid arils currently available. Although the triploids are not expected to be fully fertile, they may have enough fertility to breed with existing AAPP arilpums and expand the family. Additionally, there is the hope that the onco x pumila cross might produce an AAPP seedling from an unreduced aril gamete. 2. AAP triploids: This is similar to approach #1, but the cross is that of diploid aril x arilpum. 3. AP diploids: I would like to try crossing I. attica with diploid arils. The rationale is the same as using the triploids, although in this case the seedlings would be expected to be sterile, with the rare exception of unreduced gametes. 4. Unbalanced tetraploids (AAPT): There are a few unbalanced tetraploids of this sort, including Lawrence Ransom's "Vera girls" and possibly the antique 'Zwanenburg'. The P and T sets seem to have more affinity with each other than either do with the arils, so occasional fertility is possible. Gametes would be either AP or AT (give or take a chromosome or two), and so should produce about half AAPP amphidiploids when crossed with the existing members of the family. The APPT unbalanced tetraploid 'Persian Sapphire' also has the potential to produce AP gametes. Miltonia (Werckmeister). .../OGB/ABD. ('Teucros' x I. susiana) X I. pumila. This unregistered arilpum was produced in the early 1960s from crossing an oncogelia seedling with I. pumila. The aril parent apparently produced an unreduced gamete, making 'Miltonia' a fertile amphidiploid. Although Paul Cook had introduced 'Hoogpum Blue' and 'Hoogpum Purple' in 1956, it was Miltonia that demonstrated the potential for an arilpum fertile family with oncocyclus flower characteristics. It produced a couple registered offspring, but alas the further amphidiploid arilpums it produced have been lost. Barbarella (Harald Mathes, R. 1991). Sdlg. AP-BSF. 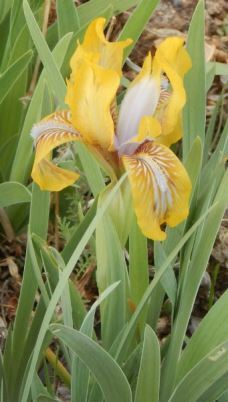 AB/OGB/ABD, 12 (30 cm), E. S. smooth gold, flushed darker at midrib; F. same; large signal spot and veining of dark mahogany; bright yellow beard. Unregistered tetraploid RC seedling X "Chocolate Heart", yellow pumila; garden name: ["Schokoladenherz"]. Aril Society, 1991. Harald Mathes's 'Barbarella' was the first arilpum to be registered from tetraploid RC x I. pumila breeding. It is pollen fertile, and has been crossed with SDBs and ABs to produce some arilbred medians of note. Aladdin's Gem (Francesca Thoolen, R. 2001). Sdlg. AP9303. AB/OGB/ABD, 10" (25cm), E. S. muted yellow; style arms yellow; F. yellow, large maroon spot; beards yellow. AR8701: ('Tel Hashi' x Holden Ht28-T: (Norris T-N81N: (Norris T-N79P: (('Kerr's Wide Falls' x I. basaltica) x (Bushey B66J2: (sib x 'Kerr's Wide Falls') x Bushey B66M3: ('Kerr's Wide Falls' x ('Charon' x 'Teucros')))) x 'Persian Pansy') x Norris T-N79P: (Norris C-N76RP: ('Kerr's Wide Falls' x I. basaltica) x Norris C-N76RM: (Bushey B66J2: (Kerr K53-44DF x 'Kerr's Wide Falls') x Bushey B66M3: ('Kerr's Wide Falls' x Austin H-18: ('Charon' x 'Teucros')))))) X 'Brownett'. Aril Society 2002. Ten years after 'Barbarella', Francesca Thoolen introduced 'Aladdin's Gem', an amphidiploid arilpum which strongly shows its oncocyclus heritage in flower form and color pattern. Its pollen is fertile, but it has not produced any registered offspring to date. 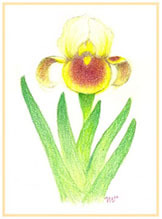 Illustration: 'Aladdin's Gem' (Thoolen '02), a fertile arilpum from a tetraploid oncogelia seedling x 'Brownett'.